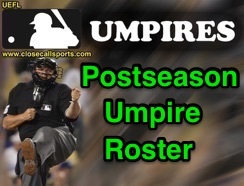 MLB's 2016 AL and NL League Championship Series umpires are now available and posted here by umpire crew assignment. Where applicable, postseason umpires are listed by position as appearing in Game 1 of the series to which they are assigned. Umpire crew rotation for the best-of-seven League Championship Series is clockwise in the infield and counterclockwise in the outfield. The Replay Official joins the on-field crew for Game 3 and remains with the on-field crew for the remainder of the series. Game 1's home plate umpire becomes the Replay Official for Games 3, and beyond. -cc denotes Game/Series Crew Chief, * denotes regular season Crew Chief, BOLD TEXT denotes first postseason assignment, ^ denotes first assignment for that specific round of the playoffs. Per UEFL Rule 4-3-c, all umpires selected to appear in the Wild Card games shall receive one bonus point for this appearance. Umpires assigned to the Division Series shall receive two bonus points for this appearance. Umpires assigned to the League Championship Series receive three bonus points for this appearance and umpires assigned to the World Series receive four bonus points for this appearance. Umpires assigned as Crew Chief to any round shall receive one additional bonus point for this role (e.g., two points total for the Wild Card Game, three points total for Division Series, etc.). Officials assigned to replay review only do not receive points for this role.